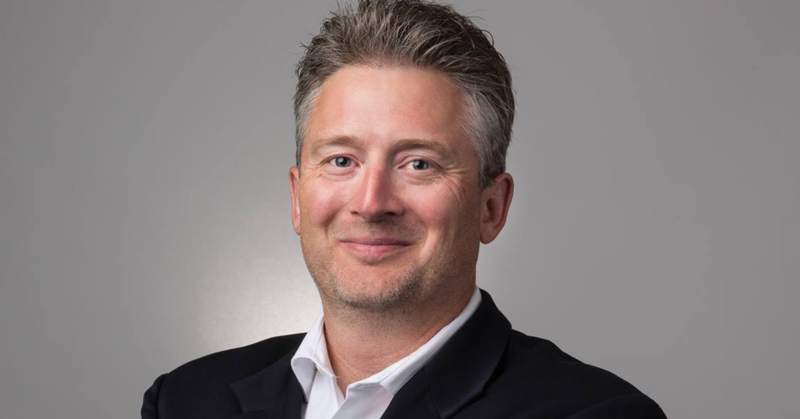 One of Conservative leader Andrew Scheer’s backbench MPs has deleted a tweet spreading false information accusing the parliamentary secretary to Canada’s Minister of Foreign Affairs of celebrating an “Islamic” takeover of Canadian politics. The excerpt from Pipes’ blog post tweeted by Calkins cites a “victory speech” following a 2005 Liberal nomination meeting. Calkins deleted his tweet Thursday afternoon. Thanks to everyone for pointing out the poor source I posted. I was unsure about what I was reading, and that was the information I found. I apologize for any consternation this tweet caused, and I was happy to take it down. 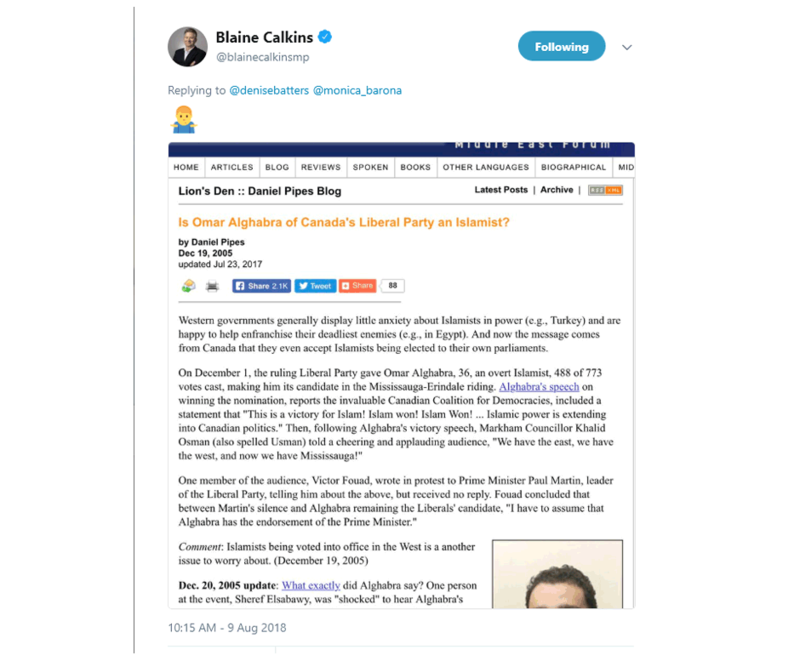 The blog sourced its information from the website of a now-defunct organization called the Canadian Coalition for Democracies, a right-wing foreign policy group run by a former Conservative staffer. The original post, filed under the “radical Islam” section of the website, was updated two days later to indicate the CCD had retracted its allegations about Alghabra. Calkins did not mention this information, contained in the original blog post, in any of his tweets. The Conservative MP was tweeting in response to another tweet about Alghabra sent a day earlier by Conservative Senator Denise Batters. Batters faced heavy criticism after she tweeted that journalists should question Alghabra about his birthplace after he represented the Trudeau government on political news programs Wednesday night, answering questions about the Canada’s diplomatic dispute with Saudi Arabia. “May have been interesting to ask him whether his birthplace being #SaudiArabia impacts this file for him,” Senator Batters tweeted. Batters also retracted her tweet Thursday afternoon. Toronto Mayor John Tory’s election campaign is standing behind its top strategist, despite his history pushing anti-immigrant and alt-right views. 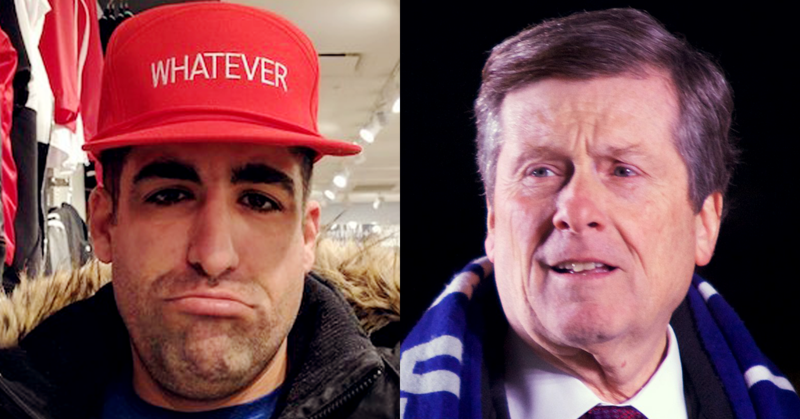 Pollster Nick Kouvalis, the top strategist on Mayor John Tory’s election campaign, was a former chief of staff to Rob Ford and later the campaign manager for Kellie Leitch’s failed Conservative leadership bid – generally considered the most anti-immigrant political campaign in modern Canadian history.